The Eyes are the window to our… P.O.V. P.O.V. when writing, stands for Point Of View. Many years ago when I joined my first critique group, I was lucky and grateful that the amazing Janette Rallison happened to be in my local chapter. She has written over twenty fabulous and award winning novels. Teaching point of view, is her specialty. She is the P.O.V. queen and I remember her saying that P.O.V. issues are the first thing that will get your manuscript nixed. It is the largest area of novel writing that beginners struggle with. Me included! Seriously, she shredded the first draft of my first novel. I have written in First, Third, and Omniscient Points of view. For some reason in the early conceptual stages, I see what point of view my story should be and my characters begin talking to me. The best way to decide how you are going to write your novel is by noticing how your characters speak to you. Do you feel an intense, close connection with your main character — enough to know how he/she would feel and act and what they would say? Or do you feel connections with all of your characters and want all of them to tell your story? It helps if you notice what you like to read. I think this will make your story unfold more naturally if you are subconsciously drawn to a specific writing style. It’s kind of how I feel about present tense. My brain doesn’t think in present tense. Some people have passionate views for or against present tense, but it just doesn’t mesh with me and I have a hard time reading it, so why would I write that way? Also, you could see what books are selling right now and what readers are liking when it comes to POV. Although, I believe that you should not write for mainstream. Write for yourself! First person – The story is narrated by a character, usually the protagonist, and the story will unfold with “I”, “me”, “mine”, or plural “we”. I like this point of view because we can convey the internal and unspoken thoughts through your character. This person takes actions and makes judgements through their eyes. I feel more intimate connections with characters that are written in first person. Second person – This point of view is rarely used. This type of story is narrated by the character referring to the reader as “you”. It’s like the narrator is telling your story or making you feel like a participant in the story. I don’t have an example that comes to mind and I would love an example if any of you have one. Second person is often used in songwriting or poetry in an attempt to connect with the audience by making the reader feel it is them. Third person – This point of view is probably the most common and gives the author the most flexibility to tell more of the story. I like writing this way for that reason. The characters are referred by the narrator as “he”, “she”, “it”, or “they”. Never “I” or “we” (first person) or “you” (second person). The narrator is an uninvolved entity who conveys the story, but is not a character. 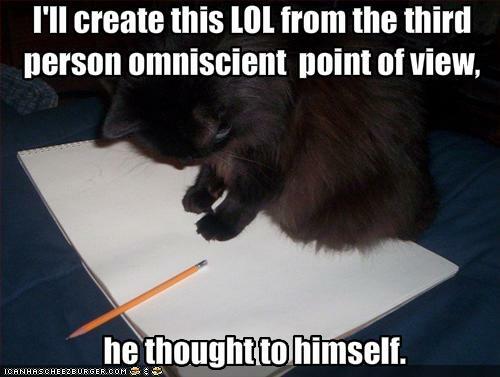 Omniscient – This point of view is presented by a narrator that has an overall knowledge of everything. I like to think of it as an all-knowing entity, like God. The narrator sees and knows the actions and feelings of all of the characters within the story. This point of view is often used in epic, complicated stories that have many characters or children’s picture books. Although we get to see what is going on with all of the many characters, often times it is hard for the reader to connect or sympathize with the main characters. If not done correctly this P.O.V. can look lazy and is the sure sign of an amateur. Alternating points of view – This is done by switching between different character points of view whether it be in first-person or third person. I also like writing this way because I can tell a more rounded story by being inside different characters heads. It is very important to switch points of views at a new chapter or page break so the reader is not confused. If you switch points of view without breaks, it is called head hopping, and that is bad. Those are the bare bones of point of view. I could go into more detail, but I wanted to discect first and third person point of view. Thanks to Janette and wonderful editors, I am super sensitive to P.O.V. mistakes now. But sometimes those sneaky devils slip past. I’m going to give some examples… see if you can spot them. * “My blue eyes met the steely gaze of his deep, coffee colored eyes.” — Cheesy, I know, but I wanted to illustrate that when in first person, the main character wouldn’t naturally think of her own eye color. Think about it, the reader puts themselves into the main character. When you look at someone, do you think. “Oh, my blue eyes are looking at your brown eyes.” Weird, just weird. 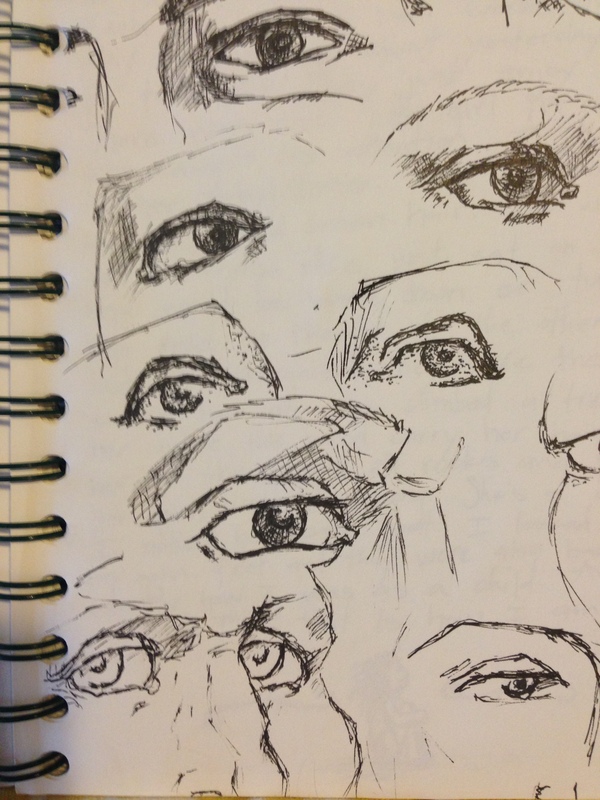 And I admit… I used to do that when I wanted to tell or remind the reader about eye color! Ahh! – Bless you Janette. When you understand P.O.V., most of your writing problems will be fixed. * It helps with showing and not telling. You describe things as the character would and it comes out more genuine and believable when tied to a solid Point of view. * Solid P.O.V. clarifies the goals and motivation. By getting into the characters head, the reader can see into their inner dialogue and desires. We feel what the character feels, and want what the character desires. * It creates higher stakes. We get into the personality of the character and see what matters internally to the character and why they react the way they do. Therefore creating a stronger drive for the character to achieve their goal. What are some of your favorite points of view that you like to read or write? I’d love to hear! — Happy writing and thanks for stopping by!